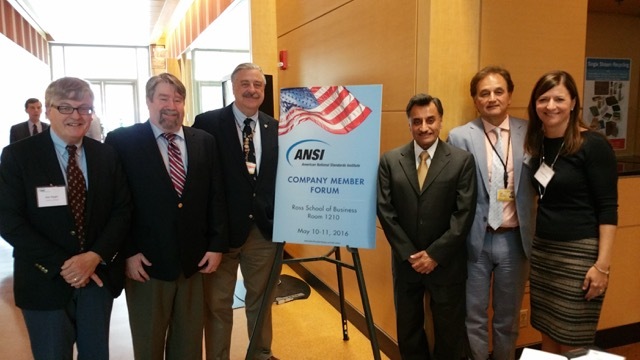 Jim Ginnaty, Standards Committee Chair of the Simon Institute and Alan S. Bigger, Executive Director of the Simon Institute recently attended the ANSI Company Member Forum (CMF) hosted by the University of Michigan in Ann Arbor, Michigan. At the meeting, Mr. Rich Robben, the Executive Director of Physical Plant and Mr. Michael A. Anthony, P.E. Senior Manager of National Infrastructure Standards Strategy introduced Ginnaty and Bigger to the Company Member Forum. A warm welcome was extended to the Simon Institute by the members in attendance and the ANSI President and CEO Mr. Joe Bhatia. Highlights of the conference included meeting the ANSI CMF members, a teleconference with the International Organization on Standards (ISO) in Geneva, Switzerland (http://www.iso.org/iso/home.html), seminars or a variety of topics that impact standards in the United States and worldwide, and a field trip to the National Sanitation Foundation (NSF) in Ann Arbor (www.nsf.org). It was obvious throughout the conference that standards are important and that such standards and the development of standards is both national and international in scope. Ginnaty and Bigger were honored to attend the conference representing the Simon Institute at such an important forum and this clearly demonstrates the Simon Institution’s commitment to standards development for the cleaning profession.